Overview: Dragonslayer is a simple mod that adds a God sword to the game. It deals a base 2000 damage and an aditional 50 damage to Dragons. Swings at 3 times the speed of a normal sword, and has a huge attack range. 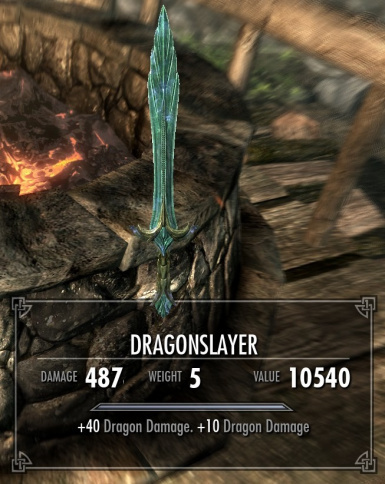 Dragonslayer is a simple mod that adds a God sword to the game. It deals a base 2000 damage and an aditional 50 damage to Dragons. Swings at 3 times the speed of a normal sword, and has a huge attack range. 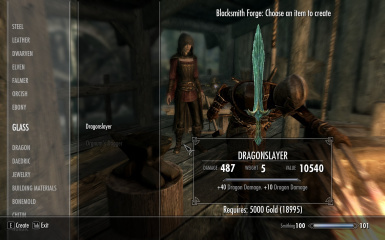 Dragonslayer can be crefted at any forge under the 'Glass' smithing tab, however you do not require the 'Glass' smithing perk to create the item. It is bought from the forge for 5000 gold and requires no other materials. It can be improved at a grindstone for 2000 gold, but requires the 'Arcane Blacksmith' perk to improve. Deals 2000 damage and an aditional 50 to dragons. Swings at 3 times the speed of a normal sword (go ahead and spam the attack button!). Has a large attack range, and is a ranged weapon, put whomever you want to attack in the middle of your crosshairs and press the attack button. Should work at any range. Due to high damage output, this sword will raise your one handed skill quite fast, and you will be at level 100 in a matter of hits. None yet! If you do find any just comment and I will try and have a update out soon. Because of high damage output, this will bring up your one handed skill very fast. If you just want to go on a killing spree be sure to save the game (not quick save, full save) if you intend on returning to your game later on. Special Thanks to everyone in Riverwood that willingly died multiple times in the making of this mod!